ParkZone is proud to present another legend in their lineup of Warbirds. Along with the North American P-51, the Corsair is arguably the most popular fighter plane of World War II. 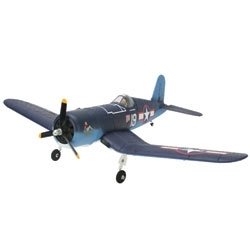 The F4U Corsair, made famous for its ability to outclimb, outrun, or outfight any enemy in its day, is an exciting addition to the ParkZone family. Referred to as “whistling death” by the Japanese in World War II, and the "Sweetheart of Okinawa" by American troops, the inverted gull wing allowed for the huge propeller to clear the deck with its short, stout landing gear. Designed as a carrier-based fighter, it was also the first Naval aircraft to have landing gear retract flush into the wing for improved aerodynamics, and it was the first fighter to exceed speeds of 400 mph. Its successful reputation and unique flying characteristics has earned the F4U Corsair its place in American military history! ParkZone’s PNP version of the Corsair features a 480 Brushless outrunner motor for exceptional performance. The fixed landing gear and steerable tail wheel allow for smooth takeoffs and landings. The attention to scale details in this plane is amazing, from its historically representative 3-color trim scheme to the pilot figure inside the cockpit. The Corsair delivers incredible looks and the immediate gratification ParkZone plane owners have grown to love, while its Z-Foam™ construction provides pilots with the durability and reliability they require in a park flyer. All you need is your own Tranmitter, Receiver, Battery and charger to get this legendary Warbird in the air.